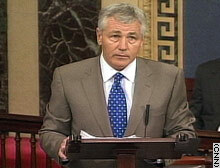 Sen. Chuck Hagel, R-Nebraska, called the current crisis in the Mideast "madness." WASHINGTON (CNN) -- Urging President Bush to turn all U.S. efforts toward "ending this madness," a leading Republican senator Monday broke with the Bush administration and called for an immediate cease-fire in the Mideast. "The sickening slaughter on both sides must end and it must end now," Nebraska Sen. Chuck Hagel said. "President Bush must call for an immediate cease-fire. This madness must stop." The Bush administration has refused to call for Israel to halt its attacks on southern Lebanon, joining Israel in insisting that Hezbollah fighters must be pushed back from the Israeli-Lebanese border. Hagel said that refusal threatens to isolate the United States and Israel and harm chances of achieving a long-term peace in the region. "How do we realistically believe that a continuation of the systematic destruction of an American friend -- the country and people of Lebanon -- is going to enhance America's image and give us the trust and credibility to lead a lasting and sustained peace effort in the Middle East?" asked Hagel, the No. 2 Republican on the Senate Foreign Relations Committee. He called on Bush to name "a statesman of global stature" as his personal envoy to the region. And he urged the administration to open direct talks with Hezbollah's backers, Iran and Syria, both of which Washington also accuses of meddling in Iraq. "Our relationship with Israel is special and historic," he said. "But it need not and cannot be at the expense of our Arab and Muslim relationships. That is an irresponsible and dangerous false choice." Bush was headed back to Washington after a fund-raising trip to Florida, and the White House had no immediate reaction to Hagel's comments. Like his frequent ally, Sen. John McCain of Arizona, Hagel is a possible GOP presidential candidate in 2008 and has been critical of the administration's handling of Iraq. But few members of Congress have broken ranks with the president over his handling of the Israel-Hezbollah conflict. Calls for an end to the 20-day conflict have increased since Israel's bombing Sunday of the Lebanese town of Qana, which left at least 54 civilians dead. Hagel said the Israeli campaign was "tearing Lebanon apart," and the resulting civilian casualties and economic damage were weakening the country and bolstering support for Hezbollah, which the U.S. State Department considers a terrorist organization. Hagel urged the administration to revive the Beirut Declaration of 2002, authored by Saudi Arabia's King Abdullah, under which Arab countries would have recognized Israel's right to exist. Hagel said that declaration was "a starting point" toward a regional settlement, but the United States "squandered" it. Meanwhile, the decorated Vietnam veteran said the United States "is bogged down in Iraq," limiting U.S. diplomatic and military options. Last week's announcement that more than 3,000 more American troops were needed to reinforce Baghdad amid rising sectarian violence was "a dramatic setback," he said. He said the 3-year-old war is wearing badly on the U.S. military, and that Iraq's fledgling democracy needs to take over more of its security responsibilities from American troops. "This is not about setting a timeline," Hagel said. "This is about understanding the implications of the forces of reality."